Clogged gutters prevent the drainage of water away from your home which can result in damage to fascia, soffit, roofing, foundation or even begin leaking into your home. Regular gutter cleaning not only prevents water damage to your home it also prevents destruction of your landscaping, avoids nesting areas for birds, mosquitoes, and other insects and helps maintain the beauty and value of your home. Gutter cleaning services consist of clearing the gutters of all debris. We use ladders with stabilizers for safety and also prevent damage to the gutters. We will make sure all of the downspouts are running freely. 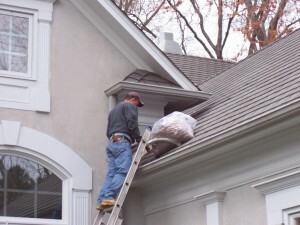 We will also make sure there is no debris from the gutters left on your landscaping, driveway, etc.